India Gate, a free standing arch, located at the east end of the Raj Path in New Delhi, is one of the most famous monuments in India and also one of the most visited places in New Delhi. 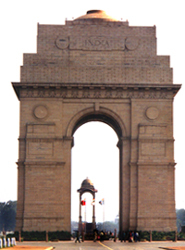 Originally called the All India War Memorial, India Gate is a war memorial in honour of the 90,000 Indian soldiers who died during the World War I and the Afghan Wars (1919). It was designed by the famous British architect, Edward Lutyens and the foundation stone was laid down by the Duke of Connaught in February 10 1921. The monument similar in design to the French war memorial, the Arc-de-Triomphe, was completed in 1931, and the same year the then Viceroy Lord Irwin dedicated the structure to the nation. The arch is a magnificent 42 mt high structure made of red sandstone standing on a low base. Rashtrapati Bhavan (the President's house) is situated at the other end of the Rajpath and one can have good view of it by standing at the base of the arch of the India Gate. On top of the India Gate, the line "To the dead of the Indian armies who fell honoured in France and Flanders Mesopotamia and Persia East Africa Gallipoli and elsewhere in the near and the far-east and in sacred memory also of those whose names are recorded and who fell in India or the north-west frontier and during the Third Afghan War" is inscribed in capital letters. The names of the demised soldiers who died in these wars are also inscribed all along the walls of the arch. There is a shallow domed bowl at the top of the gate. Soon after the 1971 Indo Pak War, a shrine namely Amar Jawan Jyoti (The flame of the immortal warrior) was erected at the base of the India Gate to honour all the soldiers who laid down their lives for protecting the nation. This four faced black marble memorial consists of a rifle placed on its barrel, with a soldier's helmet on top of the bayonet and the words "Amar Jawan" (Immortal Warrior) inscribed in gold on all its faces. It also has four eternally lighted flames to commemorate their brave deeds at the corners of the square base on which cenotaph is placed. 2 1/2km long Rajpath (King's path), a tree-lined avenue flanked by lawns with orderly flowerbeds and clipped hedges, between the India Gate and the Rashtrapathi Bhavan offers an impressive view. India gate is also the centre point of many important roads, which are now closed to public due to terrorist threats. The beautiful surroundings attract a lot of people especially during the evenings when the gate is lit up.